The app aims to help you learn poems by presenting a simple but more-ish game, in which words are removed, one line at a time, and you have to put the right ones back in, against the clock. As the difficulty level goes up, more words are taken out until eventually you’ll have to rebuild the entire line of the poem from memory. It’s a simple mechanic but one with some subtleties that we discovered during our prototyping process. Filling in the right gaps quickly becomes more than just a matter of memory – quite often we found we could deduce the right word to use as well. 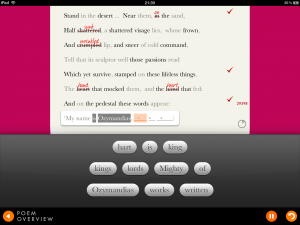 The “gaps” in the poems are represented by marks showing the stresses in the missing word, and the mixture of real words and red herrings suggested by the app can give you a clue as to what’s coming up. And of course, if you know some of the line, you can use the internal rhymes and the poem’s rhythm to figure out which of the possible words would fit best. 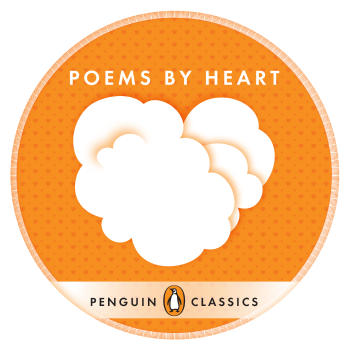 So the more we tested, the more we found we were actually thinking about and discovering the elements that made up the poem – the sense, but also the rhythm and the metaphor scheme – as we played. Getting a really high score means filling a line in seriously fast, so the more you understand the poem, the more confident you feel. 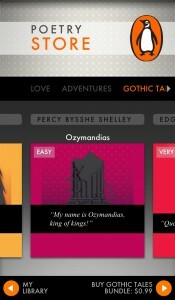 To help you remember the line and understand the sense, the app includes two audio recordings of each poem, synced up to the poem’s text. But the main goal of the app is to enable you to recite the poem for yourself, so once you think you’ve got it down you can attempt a reading from memory for yourself. The result is recorded and synced up with the poem text – so over time, the app changes from a set of recordings to a set of your recordings. You can email your recitals to people, too, and share them on social networks via SoundCloud (which, incidentally, has an awesome developer API). 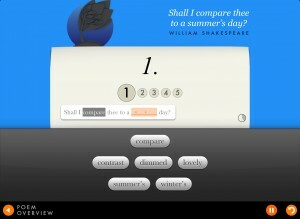 The app is released April 4th in time for National Poetry month in the US and it’s free with two poems: Shakespeare’s Shall I compare thee to a summer’s day? and William Blake’s Eternity. Another 22 poems can be downloaded in seven bundles, including all seven parts of The Rime of the Ancient Mariner (a total must for Douglas Adams fans).